Tomorrow, Sunday 8th November 2015, is election day. Burma (Myanmar) is in desperate need of change, and, if democratic process is adhered to, the people of Burma will soon have the change they deserve. This is a huge moment for the Burmese people who have fought for freedom and democracy on many fronts for many many years. They have got so close to success countless times. Aung San Suu Kyi, daughter of their national hero, freedom fighter General Aung San, is now (and has long been) the country’s best hope for a truly democratic future. In 1988, Aung San Suu Kyi founded the National League for Democracy (NLD), which is the main opposition party fighting for freedom of speech and other basic human rights for the people of Burma. The military government seized power in 1962 and has ruled ever since (first as State Peace and Development Council (SPDC) later as State Law and Order Restoration (SLORC) and now as the Union of Solidarity and Development Party (USDP), headed by Sein Thein. Aung San Suu Kyi is the nation’s favourite politician, fondly referred to as Daw Suu, or The Lady. Unlike other Burmese leaders, who seem only to care about maintaining and increasing their power over their people, Daw Suu tours the country to meet the electorate at every opportunity. Which has been tough, mainly because the military government kept Aung San Suu Kyi under house arrest for vast stretches of time, to prevent her from rousing the masses and inciting protests. This is not the first election to have raised hope for the people of Burma, but is perhaps the first in 25 years that NLD have any chance of winning. The NLD won an overwhelming majority of votes in 1990, but the military junta refused to relinquish power. At that time, SLORC amended the constitution stating that anyone with foreign children cannot be President. This ammendment was designed specifically to keep Aung San Suu Kyi out of power – she and her late British husband, Michael Aris, had two children, Kim and Alexander. They were 15 and 13 on her return to Burma in 1988, shortly before house arrest began. So, whatever happens, Aung San Suu Kyi cannot become Burma’s President. Despite appearances of democracy, subsequent elections have been rigged in various ways. NLD boycotted the October 2010 general election, as Aung San Suu Kyi was still under house arrest. Since the 2012 by-elections, Aung San Suu Kyi has held a (largely nominal) seat in the Parliament. But, according to the constitution, 25 per cent of the Burmese Parliament must be made up of unelected military representatives. To an outsider, the situation looks bleak. But Burma is full of hope. 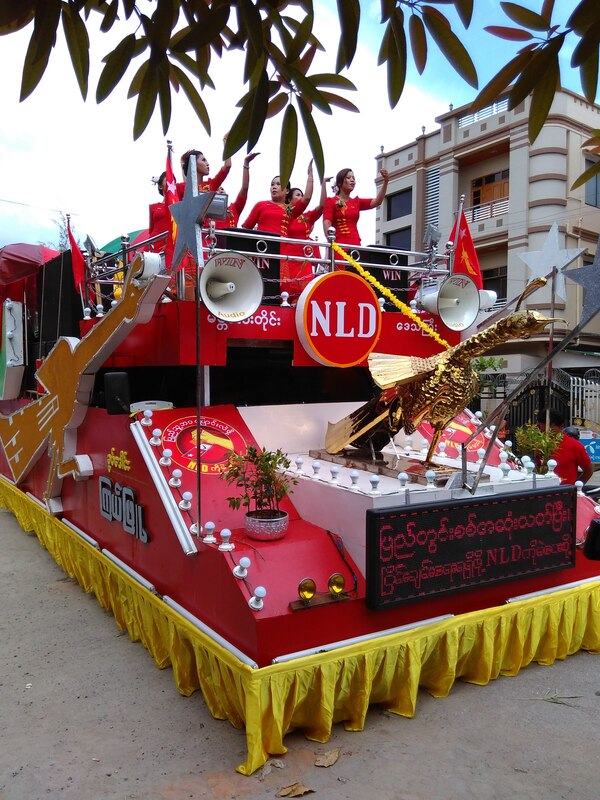 Burmese residents have been campaigning all over the country since early September, blasting NLD themed songs, displaying posters, parading the streets and generally being vocal about using their right to vote. Burmese nationals who are resident elsewhere have also been exercising that right, coming out in droves to vote in the Burmese election from Singapore last month. Plus, for the first time, the European Union will observe the elections, sending 150 monitors from all 28 member states to the country of 51 million. Of course reconciliation can only occur if there is national recognition of the will of the majority. Tomorrow is the key to Burma’s future. The Guardian: What is happening in the Burma (Myanmar) elections?